I am from the Bigstone Cree Nation in Wabasca, Alberta. I lived most of my childhood and adolescent life in my home community. As a child, my fondest memories were visiting family at my grandparent’s home. 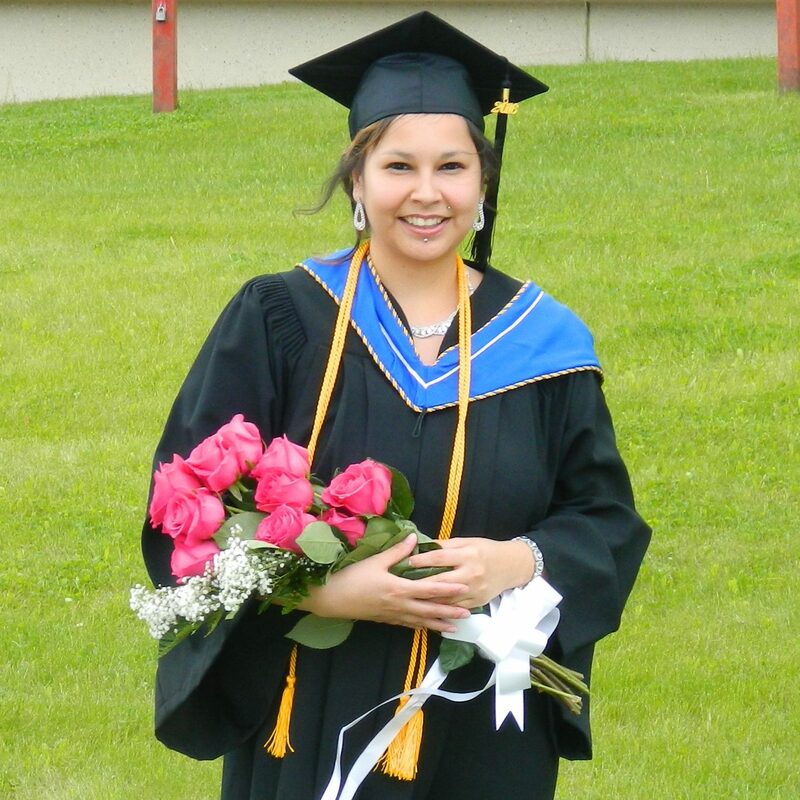 My Kohkum lived a traditional lifestyle and Cree was her first language. Sadly, I felt disconnected from her and my culture because I was not taught the language. When I graduated high school, I moved away for college and eventually found myself in Lethbridge. I walked many career paths yet I always felt something was missing in my life. As I got older, I started becoming aware of issues I was once ignorant of. I witnessed racism towards Native people on a daily basis and realized that I too was encountering it first-hand. I was observing sadness, addictions, and trauma in my own people and I became passionate about wanting to understand the root cause of what I explained as culture loss. What became more evident to me was that I too was a product of this culture loss. For this reason, I decided to enroll in the Native American Studies program at the University of Lethbridge. The new knowledge that I was gaining instilled in me a passion and determination to create change in our society. It wasn’t until I was well into my academic journey that I finally recognized the cause and effect of culture loss and the implications in my own life. In my last semester at the university, I enrolled in a language revitalization class. It was in this class that I questioned why language (and culture) loss was so prevalent in my own home community. It was this class that motivated me to want to break the cycle by analyzing my own journey and to reclaim my Cree culture. I recently graduated (June 2016) and earned my degree with Great Distinction. I have been blessed with many opportunities during my academic career. Soon, I will be on a new path as I embark on my Graduate school journey. My research is going to focus on my home community of Wabasca collecting oral stories and traditional knowledge from elders. This work is crucial because as we lose our elders, we lose our knowledge. I regret that I did not recognize or appreciate this with my own Kohkum. As First Nation academics it is our duty to preserve our cultures, our stories, and our languages for future generations. I was extremely interested in working on the Blackfoot dictionary project because it is close to my heart. I am proud to be a part of language protection, acquisition, and revitalization. During the summer of 2016, I worked as a summer student. Some of the work I contributed was: formatting definitions and creating consistency within the dictionary, researching traditional Blackfoot plants and providing more information to the dictionary, and adding pictures wherever possible. I have been honoured to experience this part of my life in Blackfoot territory and among the beautiful people and culture who have inspired me to embrace my own. So with that said, I would like to extend my sincerest gratitude to the Blackfoot people and we hope we do this project proud.